Well done to our super fitters and maintenance team. They’ve done it again. This time they’ve beat the record! Every month we report our breakdown figures, using them as one of our key performance indicators when it comes to customer service. 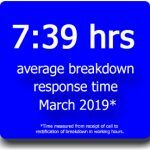 In October 2018 we managed 7 hrs 50 minutes as our record breakdown response time from the moment we got the call until the job was done. This month we have beaten that record and are very pleased to report that our team maintained an average of 7 hrs and 39 minutes to clear a breakdown.